The creatinine test checks the creatinine blood level. The creatinine lab test measures the creatinine blood level. Why is a creatinine lab test important? This creatinine test is a useful marker for screening kidney function. This Creatinine Test is a blood test. The creatinine test, also known as a creatinine lab test, creatinine blood test, and a kidney function test, measures the creatinine blood level. Creatinine is product of normal muscle metabolism in the body. Produced from creatine phosphate, creatinine is a commonly used marker to evaluate the health of the kidneys - its primary source of excretion from the body. Specifically, creatinine levels are correlated with the glomerular filtration rate (GFR) in the kidneys because, after creatinine is filtered by the kidney, very little of it is reabsorbed. Creatinine is proportional to body mass and is largely unaffected by diet. Occasionally, urine creatinine levels are used with blood creatinine levels to estimate the GFR. The creatinine test is a component of the basic metabolic panel (BMP) and the comprehensive metabolic panel (CMP). High creatinine levels are frequently used as a screening marker for worsening GFR and kidney health. Other causes of high creatinine levels include excessive meat consumption, dehydration, intrinsic kidney disease, intensive exercise and creatine or protein dietary supplementation. Creatinine lab testing is often used to evaluate kidney function prior to administering IV contrast for radiological procedures. For a more specialized evaluation of kidney function, some people order the renal function panel. To get a creatinine test near you, simply order online and get tested at your selected Quest Diagnostics lab. 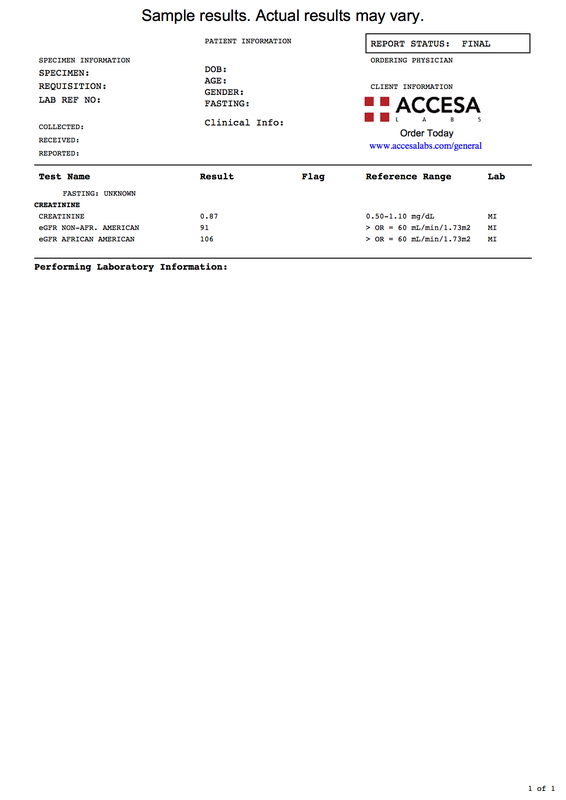 The creatinine test report, similar to the sample report link above, will report your creatinine level as a number which can be compared against the reference range in mg/dL. Creatinine Test at Guaranteed Prices.